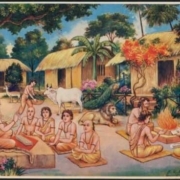 The word panchake above refers to the five most potent, result producing limbs of sadhana bhakti, namely nama- sankirtana, murti seva, sadhu- sanga, hearing Shrimad -Bhagavatam and living in Vrindavan. Not only will one attain bhava-bhakti by Vraja vasa but also Prema. The answer is that there is a certain type of “how to” mood of residence in Vrindavan. Srila Narottama dasa Thakura describes it, “One should live in Vraja with anuraga which means a continuous mood of respect, love and loving attachment; while always desiring to be counted among Shrimati Radhika’s Sakhis and Manjaris, “vrajapure –anurage- vasa, sakhi- gana- gananate.” (Prema Bhakti Candrika 56). If one does not have this mood, however, then he will invariably commit offences to the holy Dhama or the dhamavasis, and thus have to wait a long time to receive the promised bhava and prema. After one suffers for his aparadhas and deeply repents, then Shri Dhama will eventually forgive, and soon award bhava-bhakti to that sincere sadhaka. Srila Sanatana Goswamipada reveals the matchless quality of Vraja vasa. While traveling on his spiritual odyssey, Gopa Kumara arrived in Dvaraka in the spiritual sky [not in Gujarat, India]. There he directly saw Krishna and interacted with Him in a very personal way. 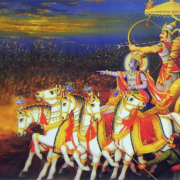 Nevertheless, Gopa Kumara still felt dissatisfied because there he could not find his coveted “Vraja bhava”. Upon arriving in this earthly Vraja, Gopa Kumara entered a similar emotional state which he describes here: “I came to Vraja and went to see the many places of Shri Krishna’s pastimes while singing my favorite names of Krishna. While loudly and sweetly singing about Krishna’s pastimes, I fixed my mind upon them. I attained such as state of ecstasy (bhava dasha), and became so emotional that it embarrasses me even to think of it. So how then can I describe this to anyone else? “In this way, I passed many days and nights. However, I did not know whether my bhajana was bringing me immense joy or immense misery. Was I living in a forest fire or was I submerged in the cooling, sweet waters of Yamunaji? That I cannot say. Then one fine day while I was sitting in a Vraja nikunja doing my bhajana, I became immersed in an ocean of crying and fell unconscious. “Suddenly dayalu- cuda- mani- Shyama appeared before me. With His cooling nectar hand, Shyama personally wiped the dust from my body. Then Madan Gopaladeva filled my nose with the most uncommon and enchanting fragrance of His divine body. I awoke from my swoon and stood up. 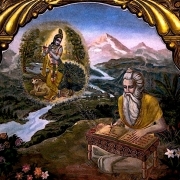 By the mercy of Shri Guru and Shri Krishna, Raganugiya Sadhakas who live in Vraja practicing manjari-bhava-sadhana will someday also have a similar experience of seeing Krishna, then losing sight, and then seeing their playful Lord once again while participating in Shyama’s sport of hide and seek with His beloved Premika Bhaktas. To reside in Vrindavan means to experience this type of separation while performing one’s bhajana, which in essence is nothing more than crying…for mercy, for Prema, for seva and for the sweet Darshan of Radha- Govinda- Yugala. And this is exactly what Srila Narottama dasa Thakura means by saying one should live in Vraja with anuraga. 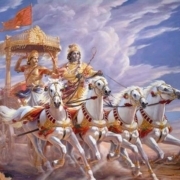 Without a doubt, the best example of living in Vraja with intense anuraga is seen in the lives and writings of Shri Rupa, Sanatana, and Srila Raghunatha dasa Goswamis. By always hearing/reading their anguished, heart-rending words of separation from Radha-Madhava, a fortunate sadhaka will continuously cry and cry until the waves in the river of his tears carry him along to the lotus feet of Priya Radha. Of course, this will never ever happen just by living a day in Mumbai, Moscow, Manhattan or anywhere in this maya jagat! The word Mathura in Mathura-mandala means “to churn, spin or agitate”. And that’s exactly why residence here is so very special, because Vraja-Dhama has the power to agitate one’s mind with thoughts and feelings for Krishna, and make one forget everything else! From my 29 years of continuous residence in Vrindavan, I can personally say, that unlike anywhere else in the world, Vrindavan has a distinctive other worldly atmosphere or ambience. There is some special enchantment in Vraja that practically every visitor feels upon coming here. Devotion to God is imperceptibly floating in the air. It’s all-pervasive, touching every heart with a drop of joy. It’s the kind of happiness every heart hankers for. This is the taste of Krishna bhakti, and this Vrindavan is the land of Krishna’s love, waiting to embrace all who venture forth. “Beyond all spiritual abodes is the abode of Vraja-loka, or Shri Gokula, which is also called Shri Goloka, Shvetadvipa and Vrindavan. Like Shri Krishna’s transcendental body, Gokula is unlimited, supreme and all-pervading. Vraja-loka spreads above and below without any restriction. Although, by Krishna’s wish, it manifests in the mundane universes, it only has one basic form, and not two separate ones. In short, living always in Vrindavan, vraje vasa sada, means at the ultimate level to always meditate upon Radha-Krishna’s asta-kaliya-lilas while, ideally if one can, residing in a nitya-lila sthali like Radha Kunda, Govardhana, Varsana, Nandagoan, Yavata, or others. 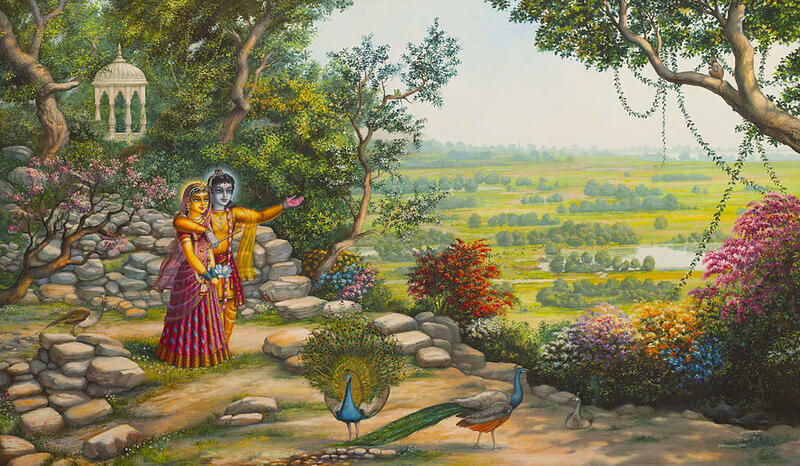 If physical residence in Shridhama Vrindavan is impossible, however, then Shri Jiva Goswamipada advises that one can live elsewhere, but always remember Radha-Govinda’s eternal pastimes in Vrindavan. Physical + mental Vrindavan is best, but only mind in Vrindavan will also bring success in bhajana. “O Hari, Hari! When will I be able to live in Vrindavan, and see the beautiful radiant forms of Radha Govinda Yugala? When will I give up the happiness of sleeping in a wonderful, luxurious bed, and smear my body with the dust of Vraja, vraja dhuli? When will I give up the desire for tasty food, and live on begged food (madhukari) in Vraja? Sri Vrndavana dhama ki jai! Jai Jai Sri Radhe!